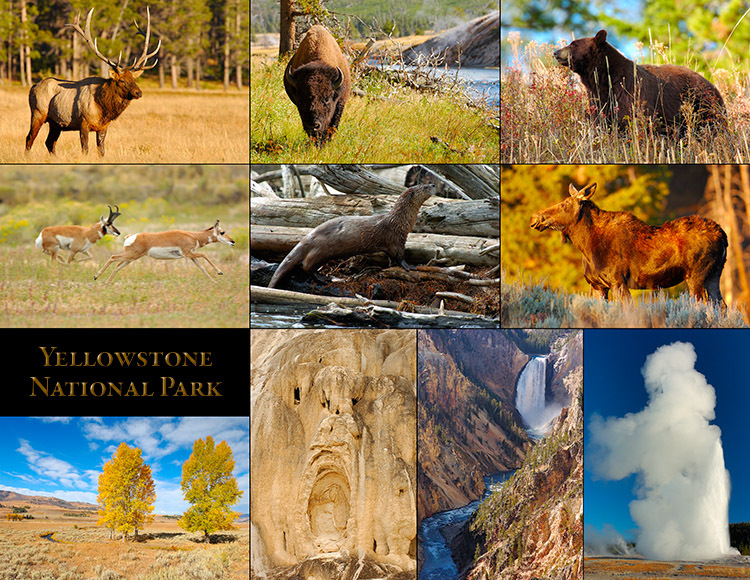 Wildlife images from Yellowstone National Park are in the Wildlife section. 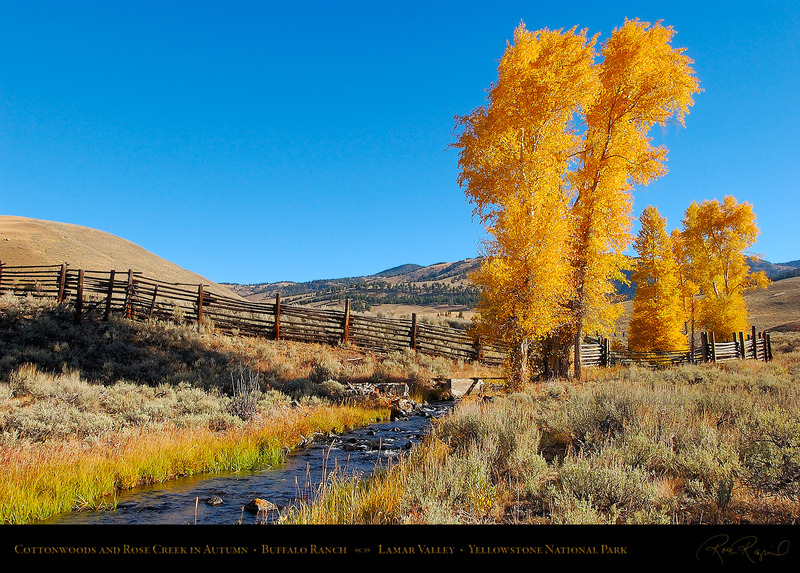 The Banner below leads to the Photoshelter Scenic Collection where a Gallery can be selected. 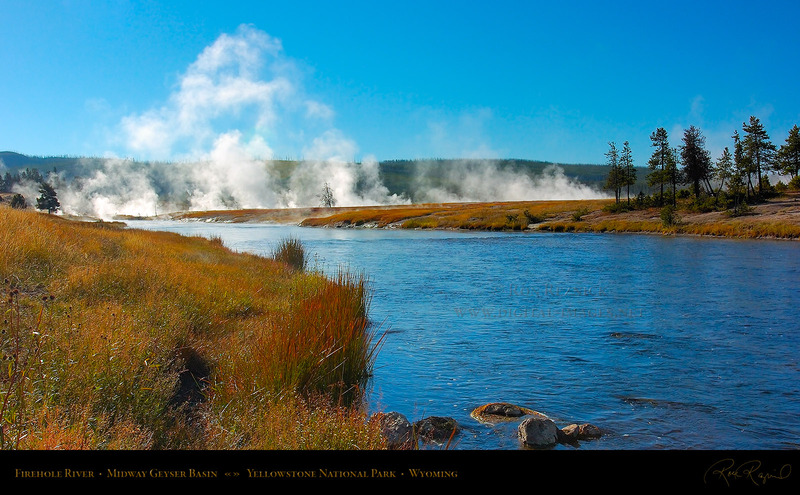 Geothermal steam rises above the Midway Geyser Basin off the Firehole River in Yellowstone National Park. 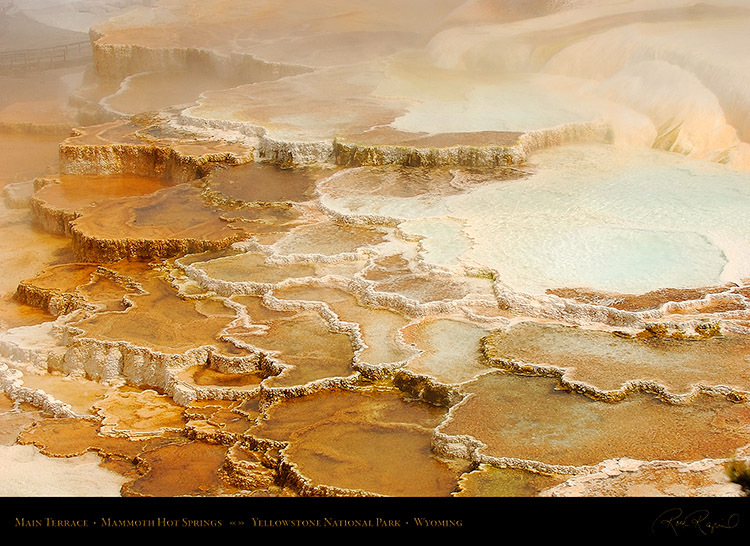 Excelsior Geyser Crater and Grand Prismatic Spring, the largest hot spring in Yellowstone National Park. 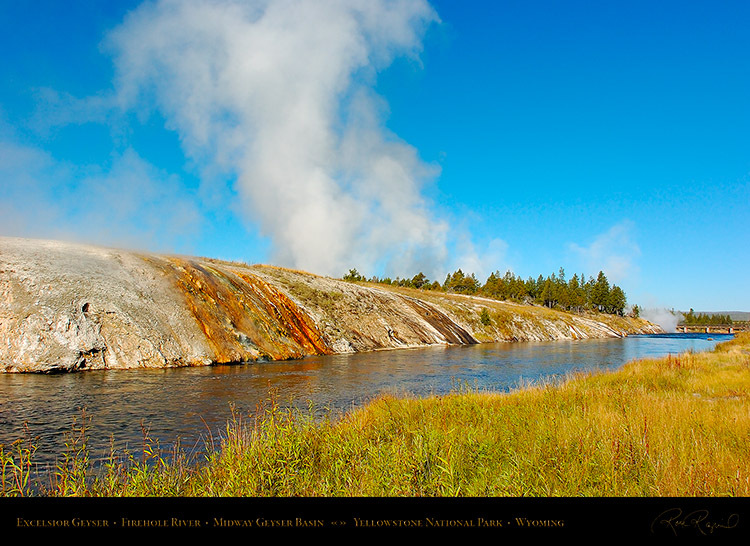 4500 gallons of 200 degree F. water per minute (6 million gallons per day) into the Firehole River. 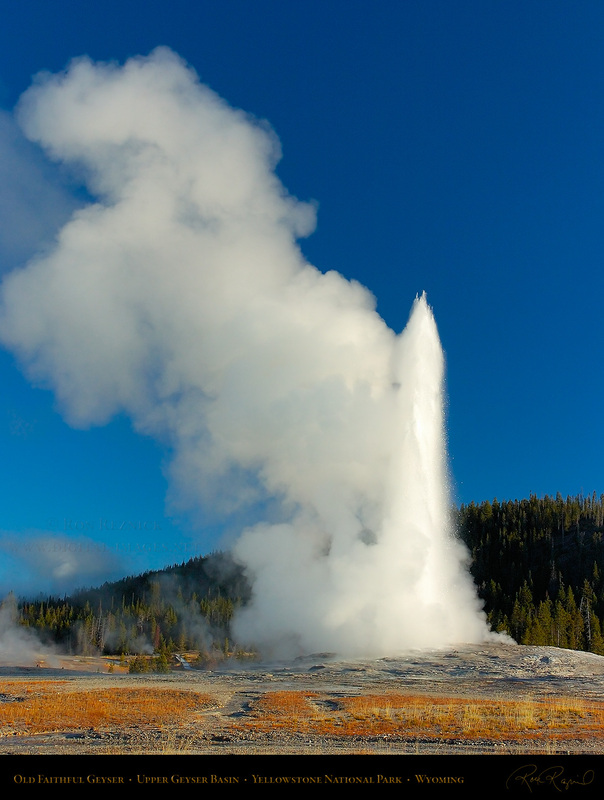 geyser awoke after 95 years for a 46 hour period in September 1985, with eruptions of 30-75 feet. rimmed with brightly colored grasses stained by colonies of cyanobacteria in the Mud Volcano area. 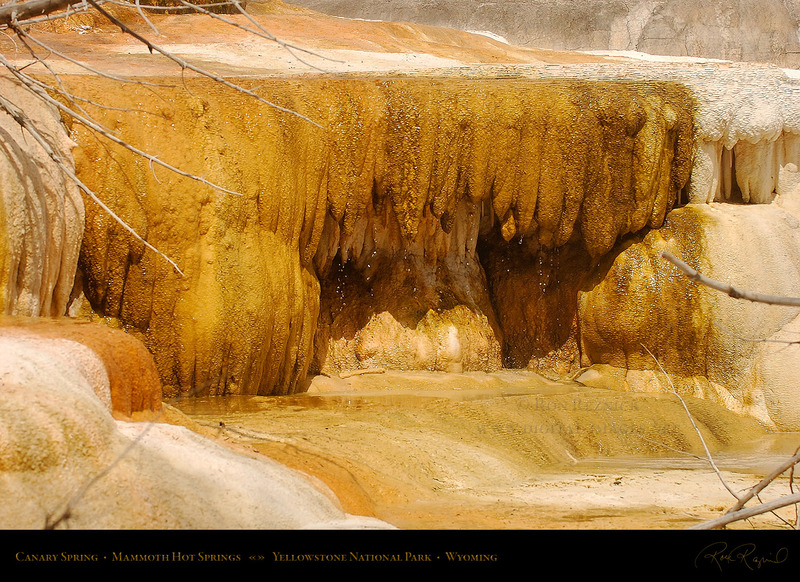 Sunlight reflects off steam rising from the chromatic face of Palette Spring at Mammoth Hot Springs. 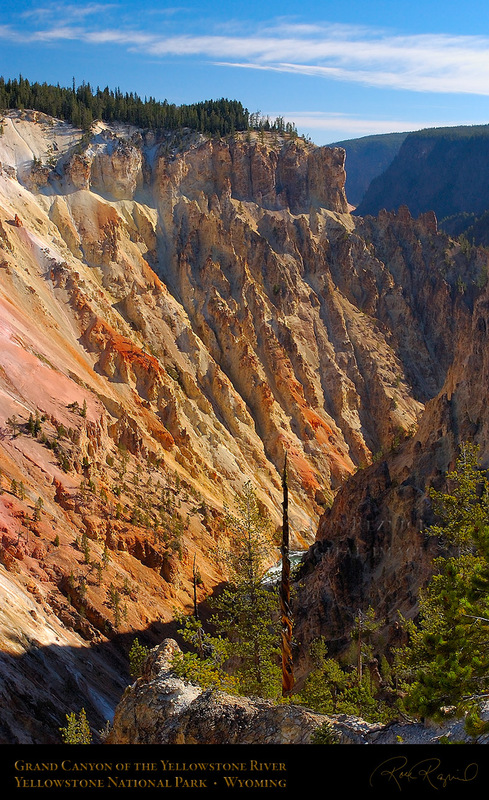 ridge, depositing deep layers of travertine in several interesting and colorful patterns along the hillside. growing in the spring. Canary Spring is one of the most regularly active springs in the Main Terrace Group. 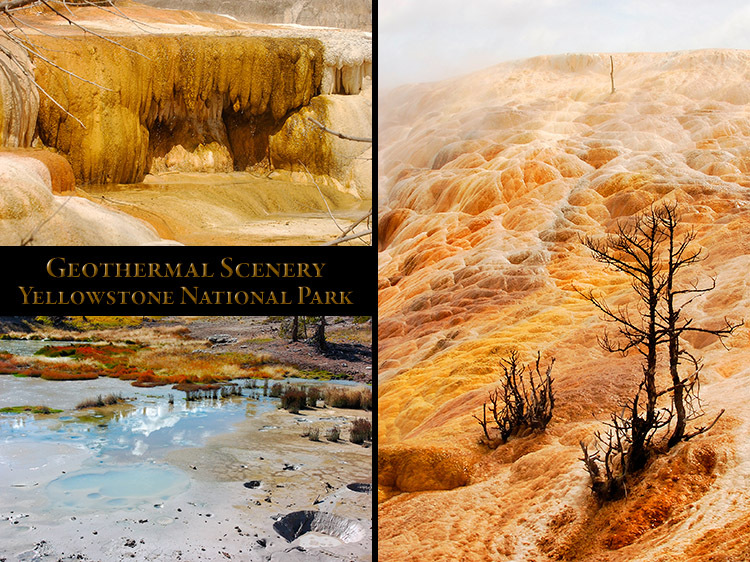 A series of terracettes forming on the Main Terrace at Mammoth Hot Springs in Yellowstone National Park. slowly rising pool. Algae forming in the groups of large scallop-shaped terracettes turn the water reddish-brown. 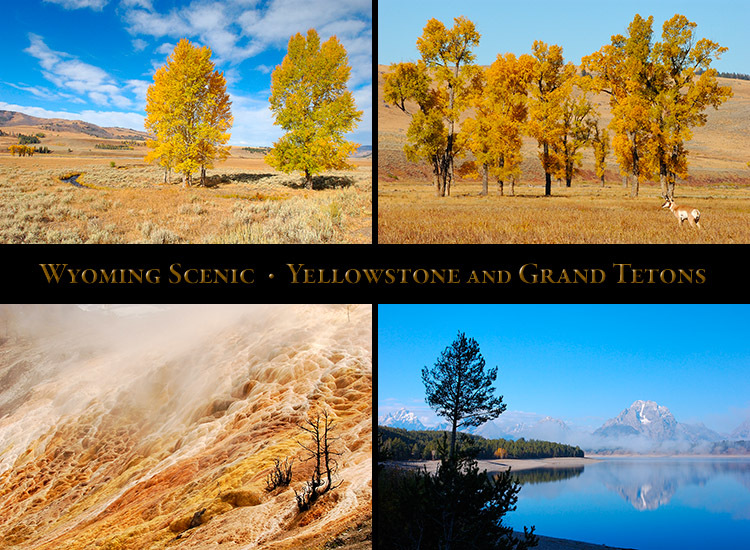 Click the Display Composite above to visit the Yellowstone Geothermal Scenery page. 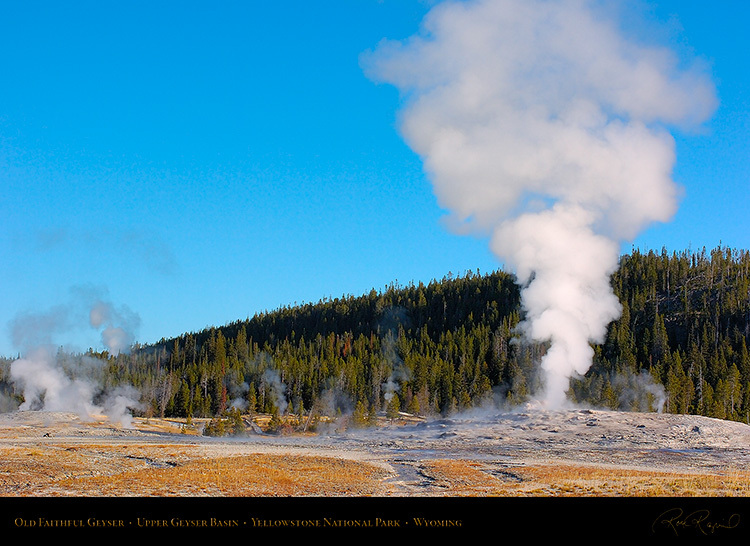 Steam rising from Old Faithful Geyser and other geysers in the Upper Geyser Basin. Old Faithful Geyser was named by the Washburn Expedition in 1870 for its regular eruption schedule. 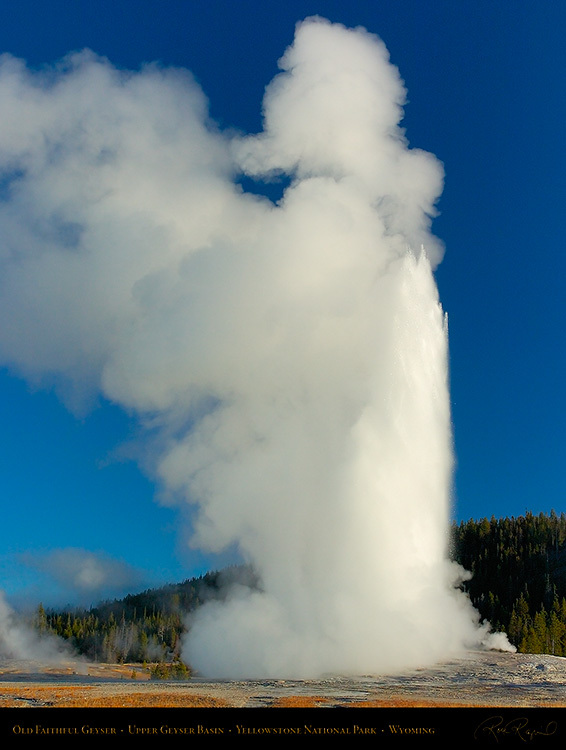 While this cone-shaped geyser does not erupt in exactly spaced intervals, its schedule is predictable. predictable within a plus-or-minus 10 minute window, based on the length of the previous eruption. when an eruption is imminent. As the time approaches, people gather around the benches 300 feet away. water circulation, allowing pressure to build up. The constriction near the vent acts as a nozzle, creating a jet. obscured by the huge cloud of accompanying steam. 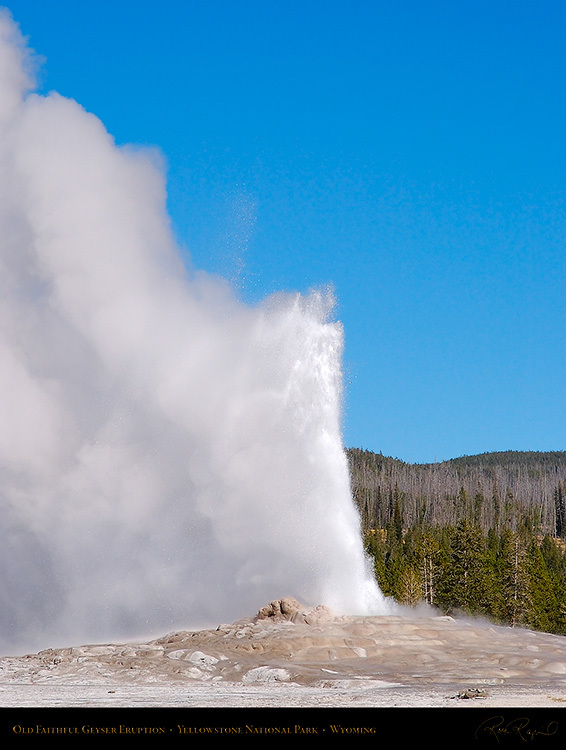 Old Faithful eruptions can throw 4000-8000 gallons of water between 106 and 184 feet high. fill the chamber, they oscillate water in the conduit, eventually leading to a steam explosion. This bubble trap is what causes the smaller eruptions before the major explosive eruption. 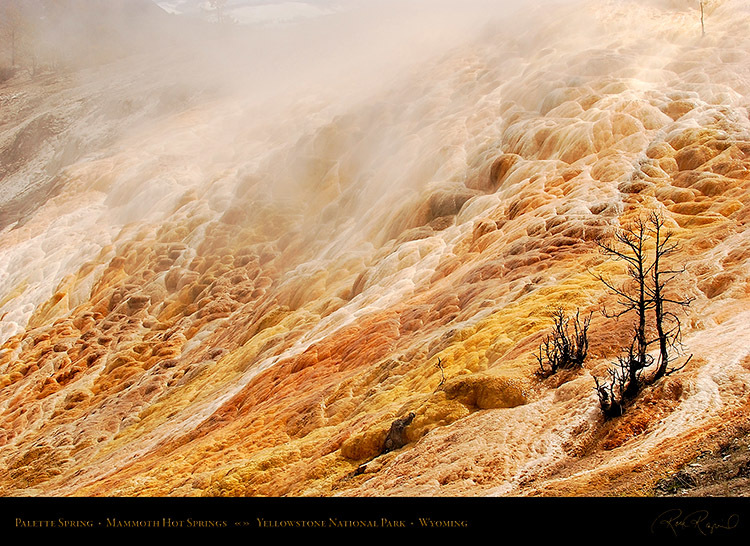 Upper Geyser Basin early one autumn morning in Yellowstone National Park, Wyoming. 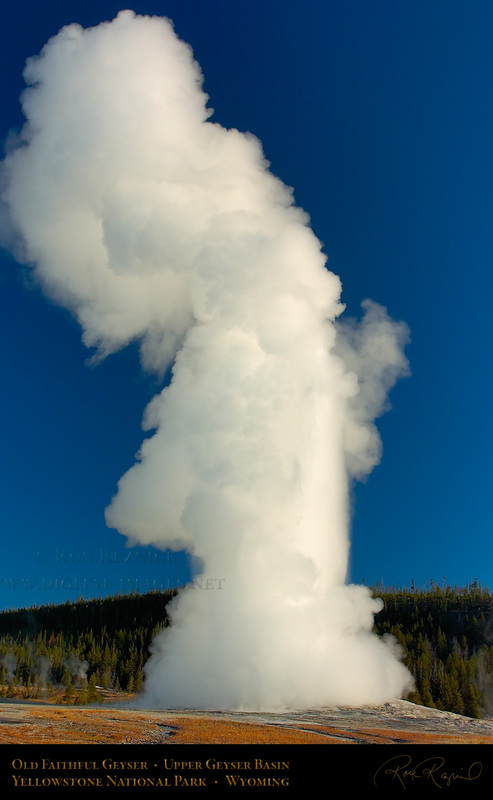 showing a five shot sequence of an early morning Old Faithful eruption. 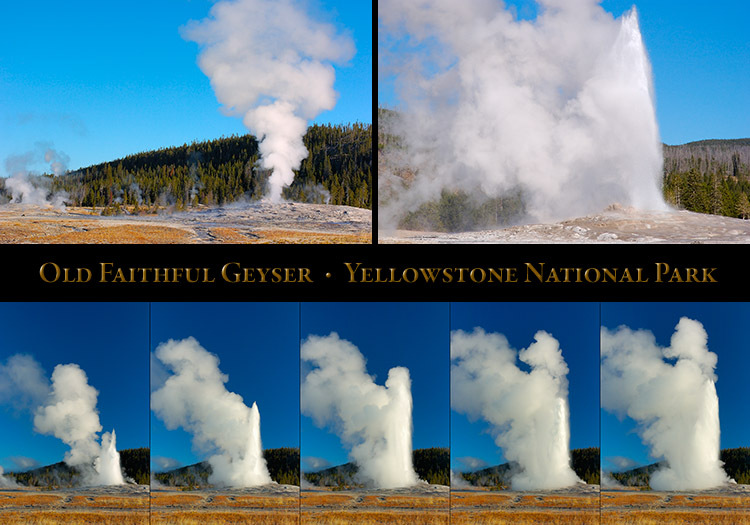 Click the Display Composite above to visit the Old Faithful Geyser page. 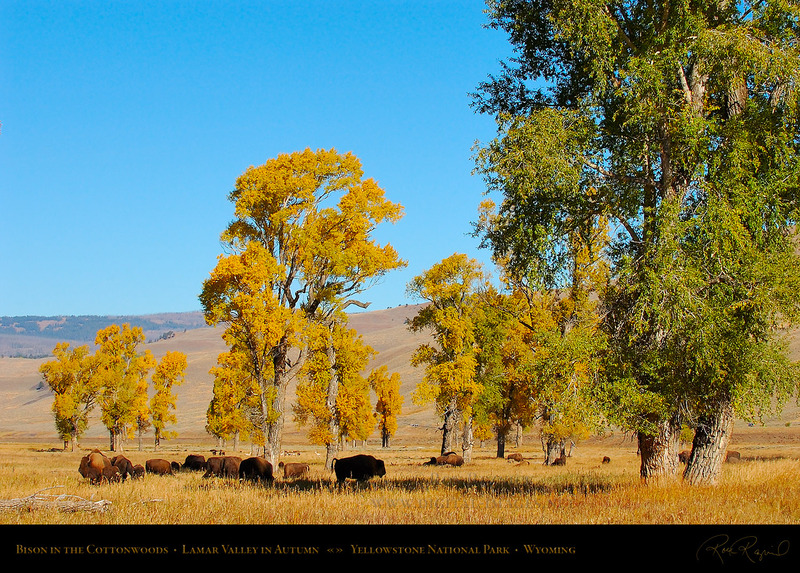 Bison browsing below a grove of Cottonwoods near Buffalo Ranch in the Lamar Valley. 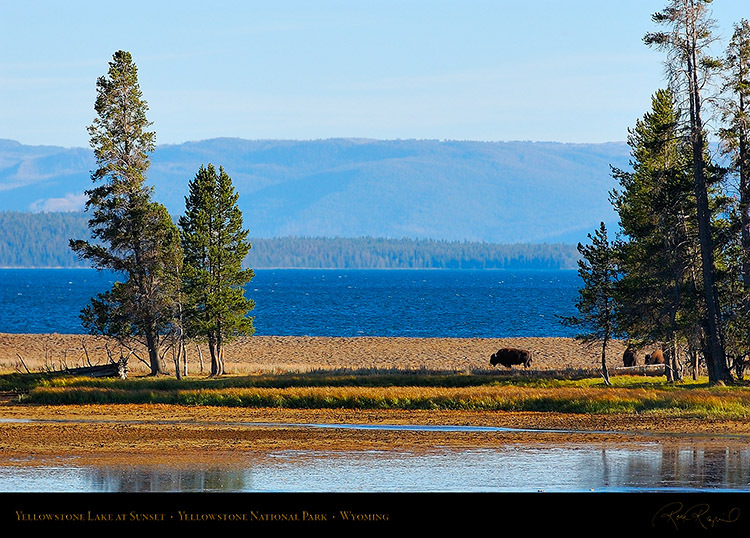 of the few remaining bison in Yellowstone to prevent the extinction of the species. had reduced the population to 23 by 1902, all of which were in Pelican Valley. that by 1954, the central herd had expanded to 1300 individuals. Cottonwoods in full autumn color beside Rose Creek at the Buffalo Ranch in the Lamar Valley. 28 Plains bison (including four new calves) were rounded up and moved to the Lamar Valley. 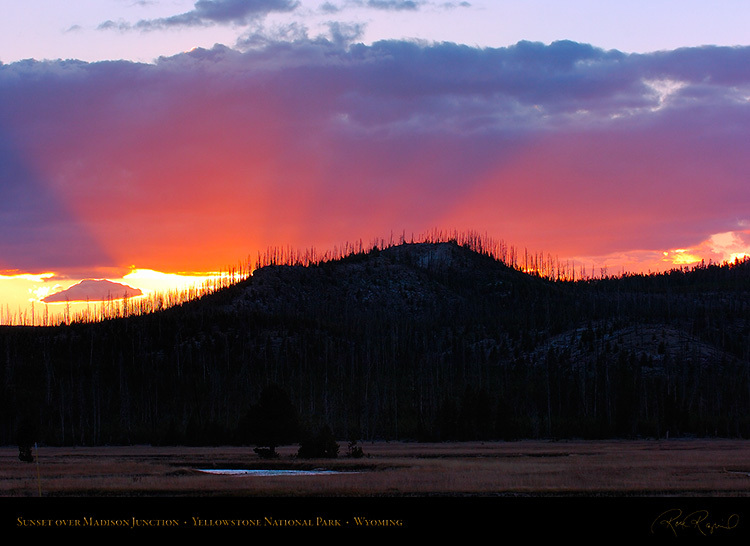 Yellowstone Association, where field seminars are held and students are lodged. Cottonwoods beside Rose Creek in the Lamar Valley in autumn. Bison, Pronghorn, Bears, Elk, Coyotes and Gray Wolves (reintroduced in 1995). 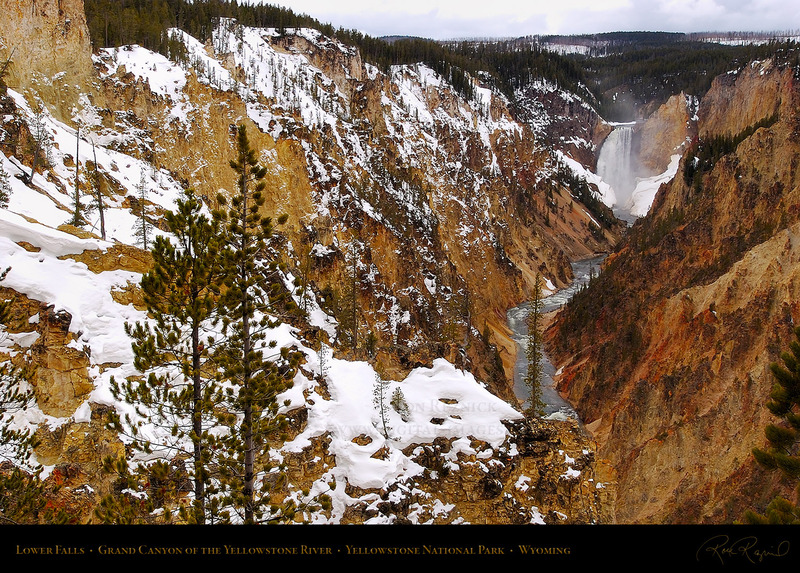 The Grand Canyon of the Yellowstone and the Lower Falls on the Yellowstone River. 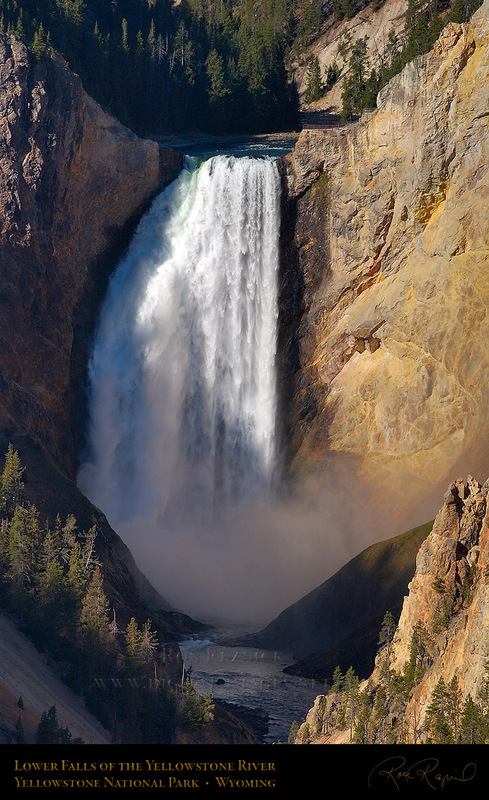 The Lower Falls of the Yellowstone at 309 feet tall is the largest volume waterfall in the Rocky Mountains. down to Tower Fall, cutting through rhyolite lava flows from the supervolcano eruption 640,000 years ago. a series of massive flash floods which caused immediate and catastrophic erosion of the canyon. 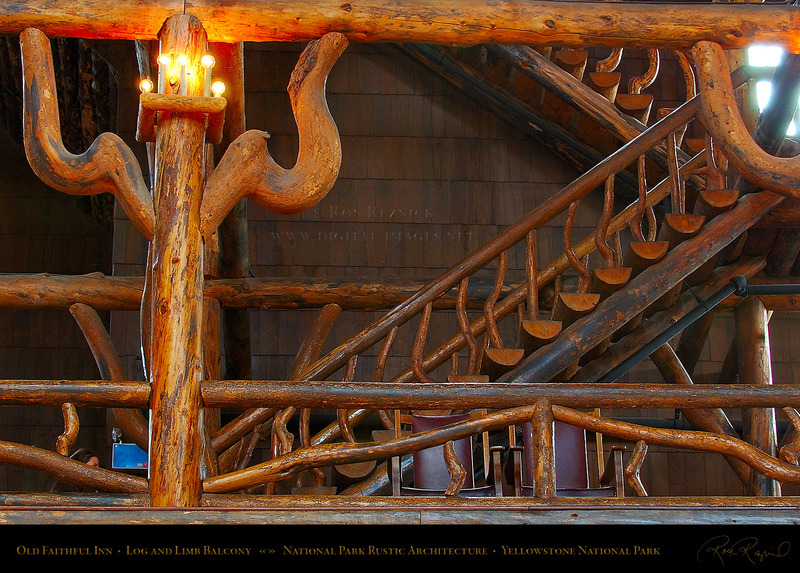 Detail of one of the rustic balconies at Old Faithful Inn, built from curved and twisted Lodgepole Pine. All logs, branches, and the unusual twisted brackets were acquired from trees 8 miles from Old Faithful. matched up sets with similar bends to make peculiar brackets which create a woodsy atmosphere. Bison grazing at sunset in autumn, beside the mouth of the Yellowstone River at Yellowstone Lake. Red-orange beams pass under the clouds as the sun hits the horizon beyond Madison Junction in autumn. 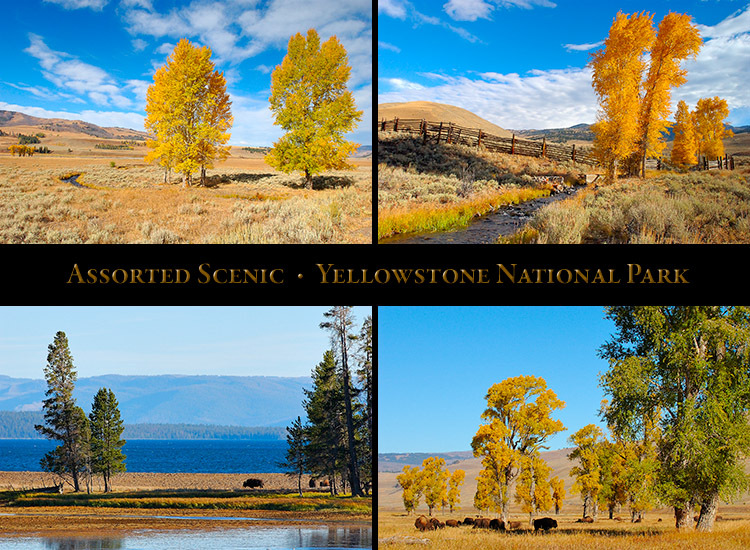 Click the Display Composite above to visit the Yellowstone Assorted Scenic page. 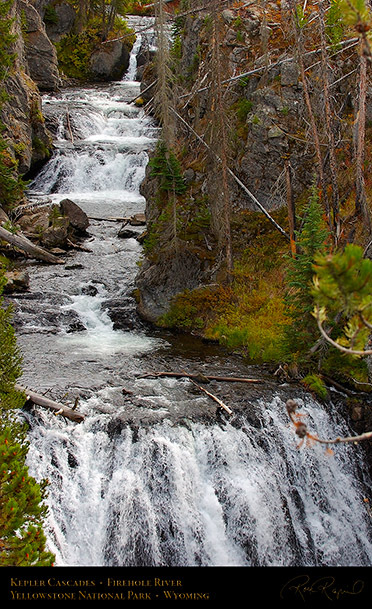 Kepler Cascades is a series of falls on the Firehole River, about 2.5 miles south of Old Faithful. 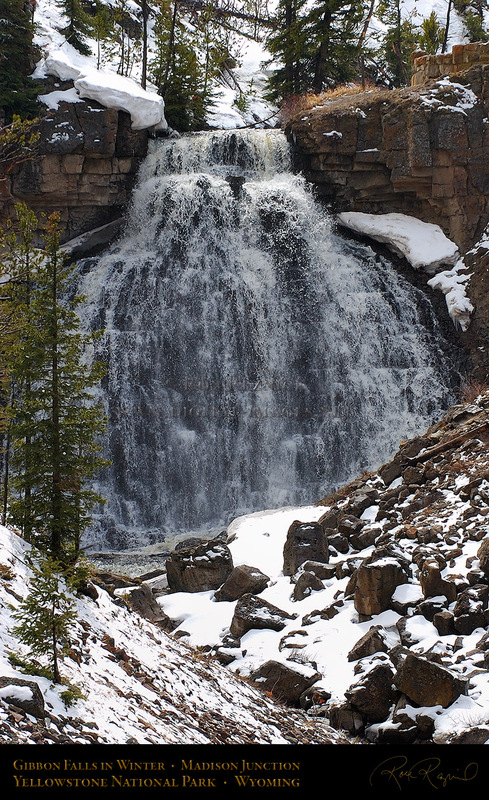 The cascades fall about 150 feet over multiple drops, the tallest of which is 50 feet. Gibbon Falls is an 84 foot waterfall between Norris Geyser Basin and Madison Junction, where the Gibbon River drops over the Northern Escarpment into the Yellowstone Caldera. 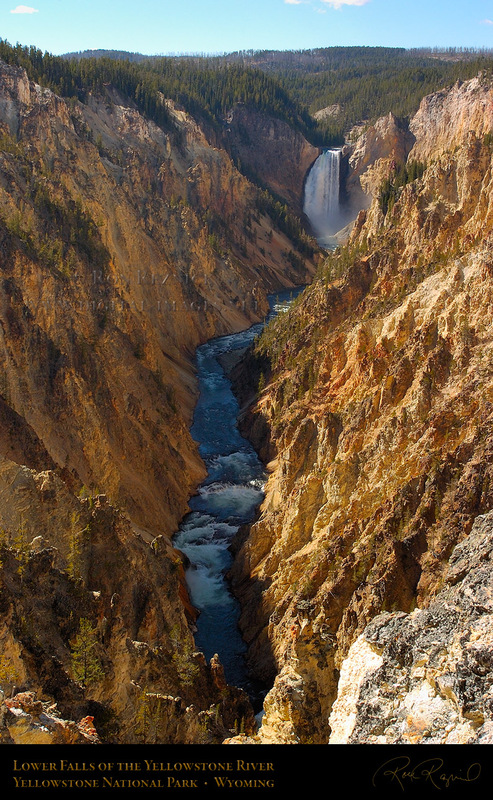 The Grand Canyon of the Yellowstone and the Lower Falls from a viewpoint to the right of Artist Point. 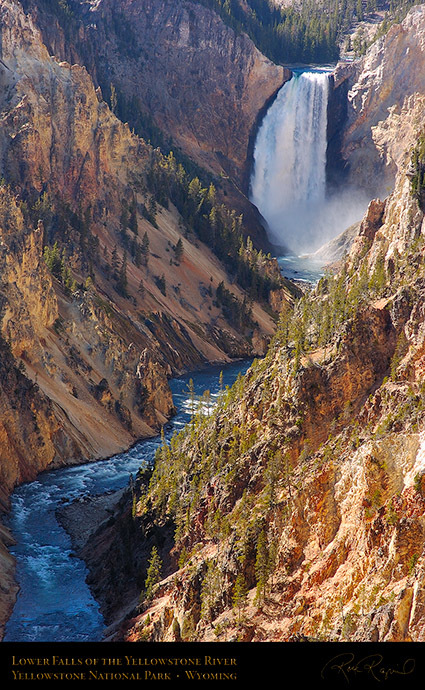 Offering an exceptional view of the Lower Falls, Artist Point juts out into the canyon from the south rim. he had made from Moran Point, the viewpoint which was named for him on the 1871 Hayden Survey. Lower Falls from Artist Point on the south rim. Lower Falls from Lookout Point on the north rim. 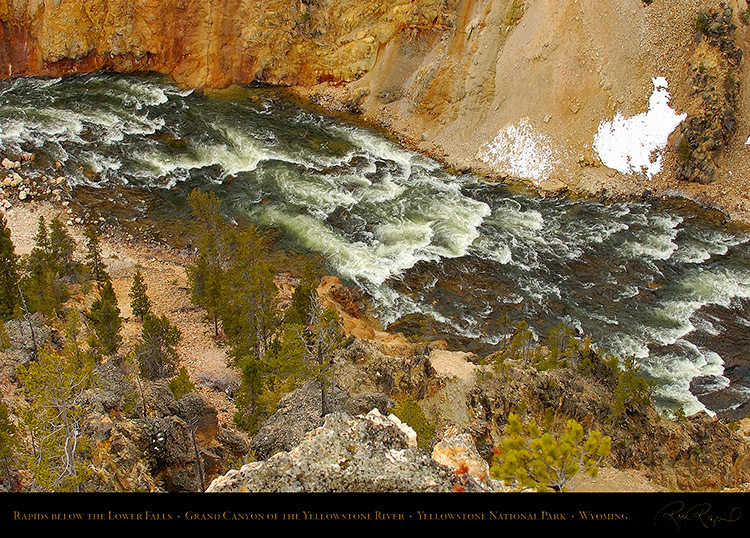 Rapids on the Yellowstone River below the Lower Falls, late winter in the Grand Canyon of the Yellowstone. 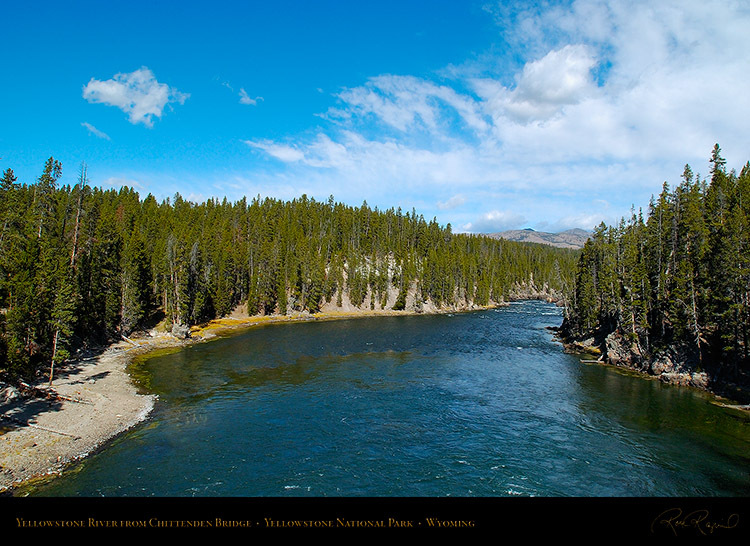 The Yellowstone River just upstream of Upper Yellowstone Falls, taken from the Chittenden Bridge. which crosses over the Yellowstone River to the viewpoints over the Grand Canyon of the Yellowstone. led visitors on tours to the South Rim. The 1902 bridge was the first to provide road access. It was replaced with the existing bridge to widen the road for modern automobile traffic. 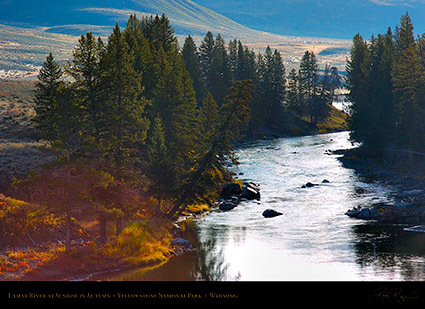 The Lamar River at sunrise, taken a little over a mile past Crystal Creek near the entrance to the Lamar Valley. 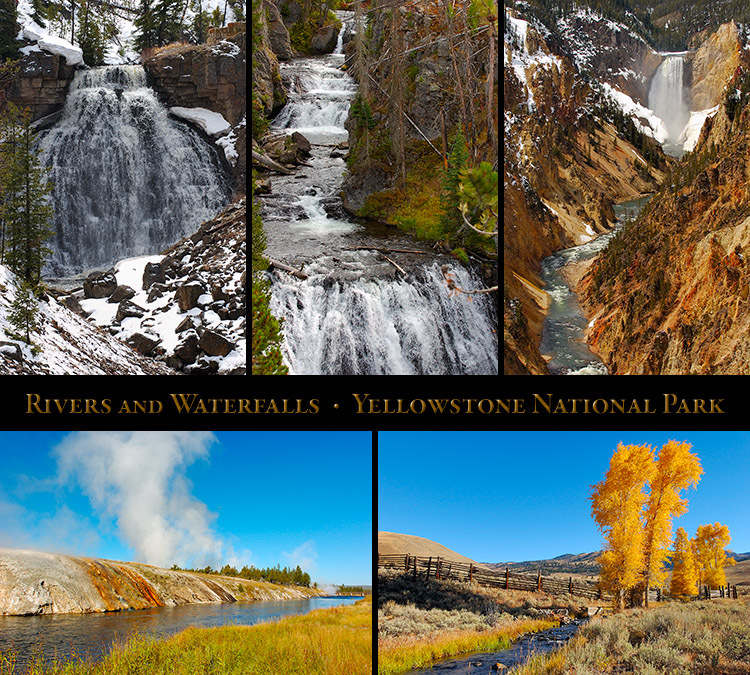 Click the Display Composite above to visit the Yellowstone Rivers and Waterfalls page. extending to the left of the image. At the far left are Grand Teton, Mount Owen and Teewinot Mountain. 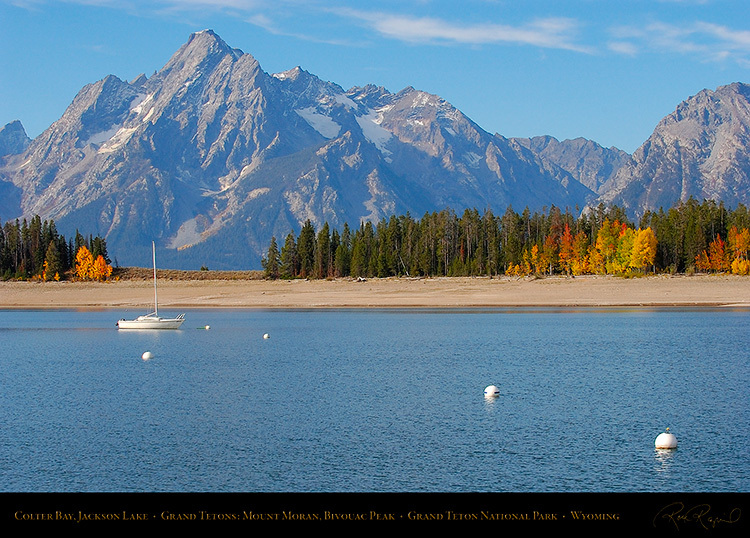 Mount Moran forms a backdrop to this image of a sailboat on Jackson Lake near Colter Bay. of Yellowstone National Park and to see the Teton Range. John Colter was the first mountain man. 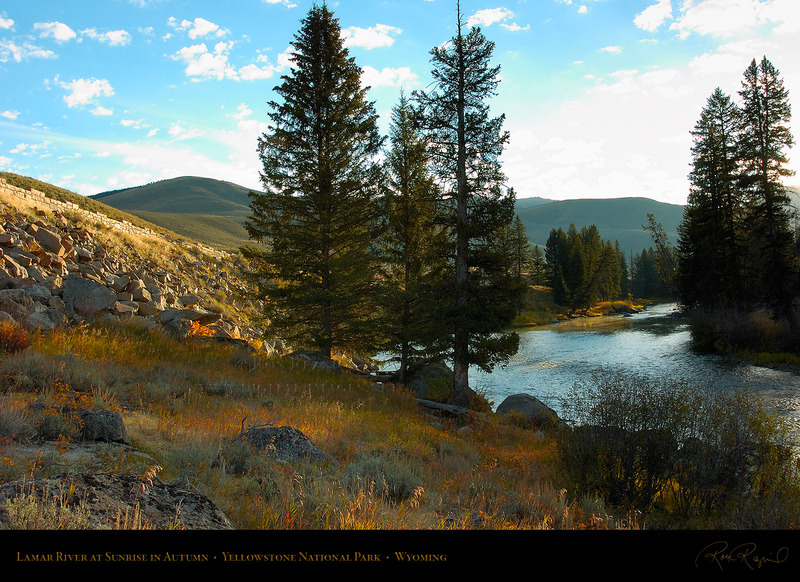 of the mountain men of the Rocky Mountain Fur Company), then headed north and east to Yellowstone. 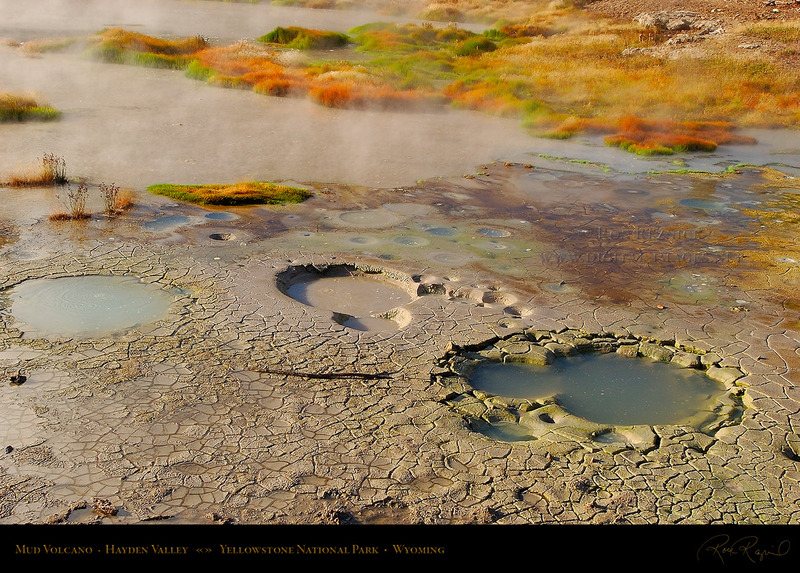 bubbling mudpots and other geothermal features. They jokingly referred to the area as “Colter’s Hell”. 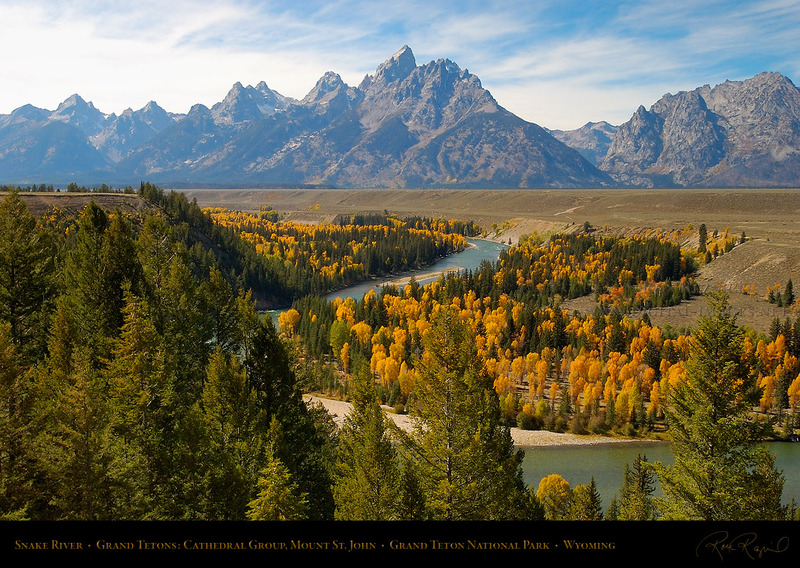 The Cathedral Group looms over cottonwoods north of Schwabacher’s Landing in Grand Teton National Park. Left to right are Buck Mountain, Mt. Winter, South Teton, Middle Teton, Grand Teton, Mt. Owen and Teewinot. 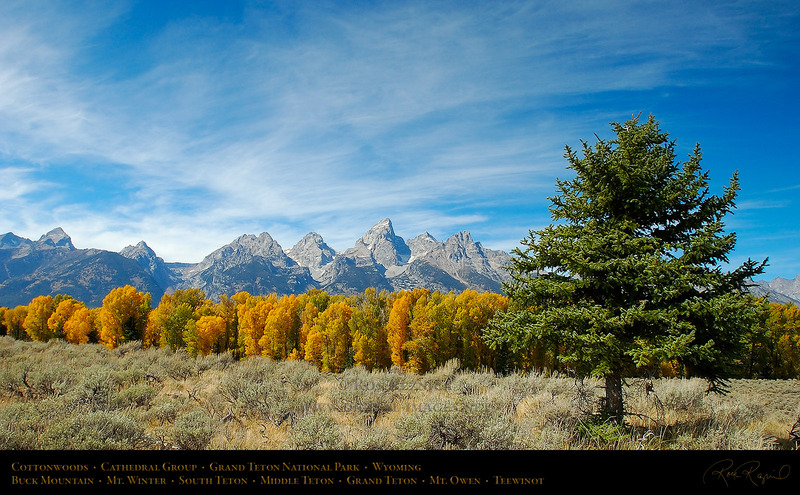 most of which are over 12,000 feet, together representing 8 of the 10 highest peaks in the Teton Range. Mount Moran, which is easily identified by the prominent landmark of Skillet Glacier on its eastern face. 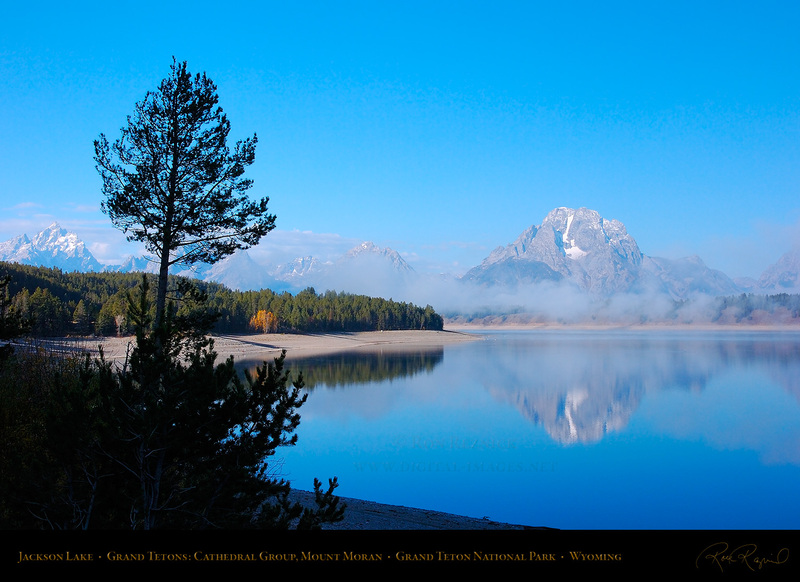 Morning fog over Willow Flats, with Mount Moran in the distance. The prominent shape of Skillet Glacier dominates the eastern face. enormous sum at the time of $10,000, and captured the imagination of the nation. 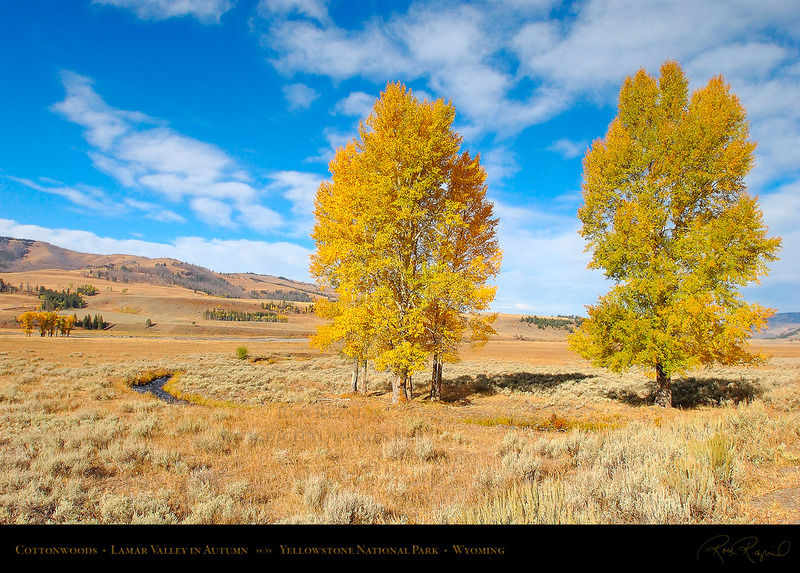 The Snake River winds through the valley of Jackson Hole on its way west from Jackson Lake. Rocky Mountains and Tetons, along the Snake River to Idaho and on to the Columbia River in Oregon. 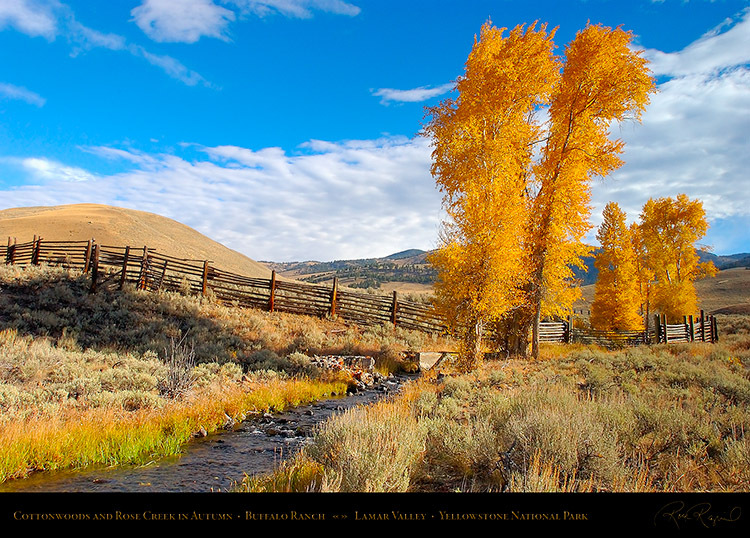 as a part of the Oregon Trail, for hundreds of thousands of settlers traveling from the east to Oregon. 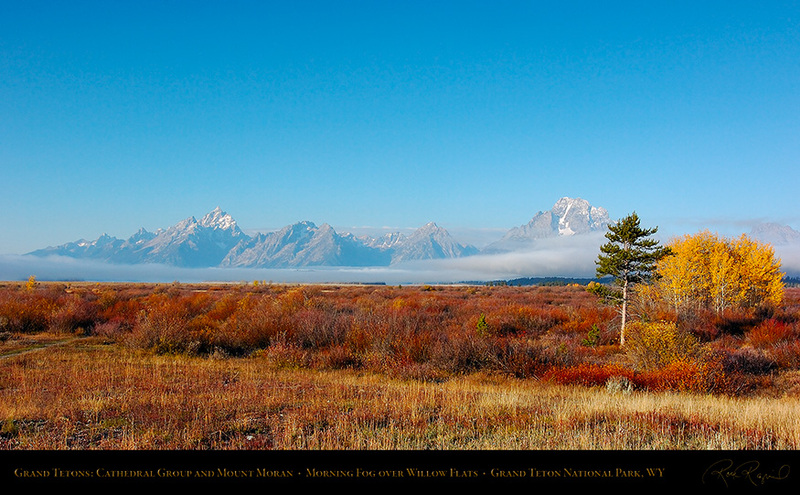 Grand Teton, Mount Owen and Teewinot, with Disappointment Peak at the far left. 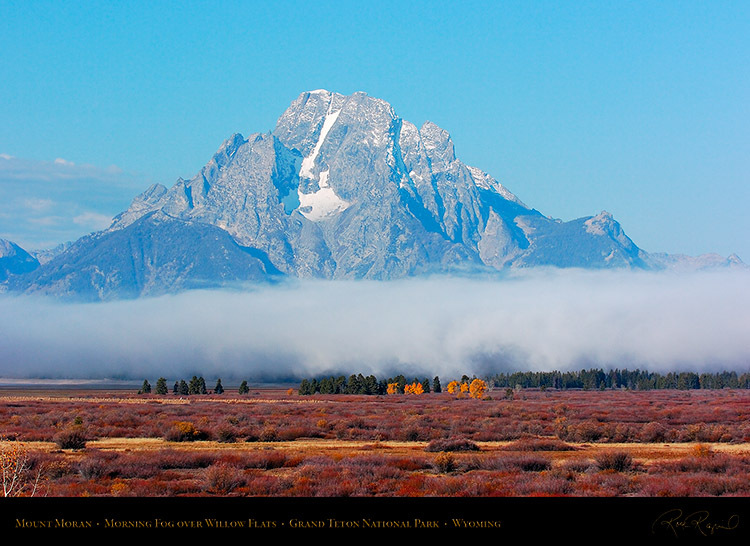 Grand Teton, at 13,775 feet, is the highest peak in the Teton Range of the Rocky Mountains. 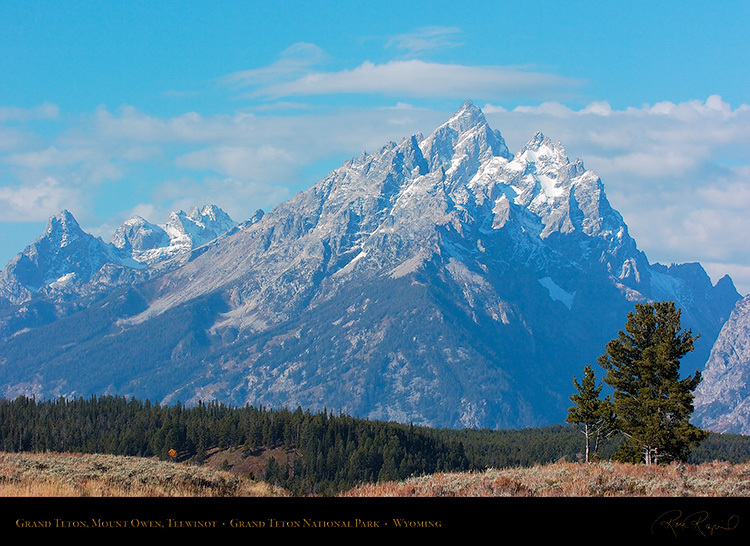 who named the breast-shaped peaks le trois tetons (three teats), and the largest Grand Teton. fact, this section nearly killed Owen the year before in his second unsuccessful attempt. The second tallest peak in the Teton Range (Mount Owen) was named for William O. Owen. greatest in the history of American mountaineering, and it will most likely never be resolved. 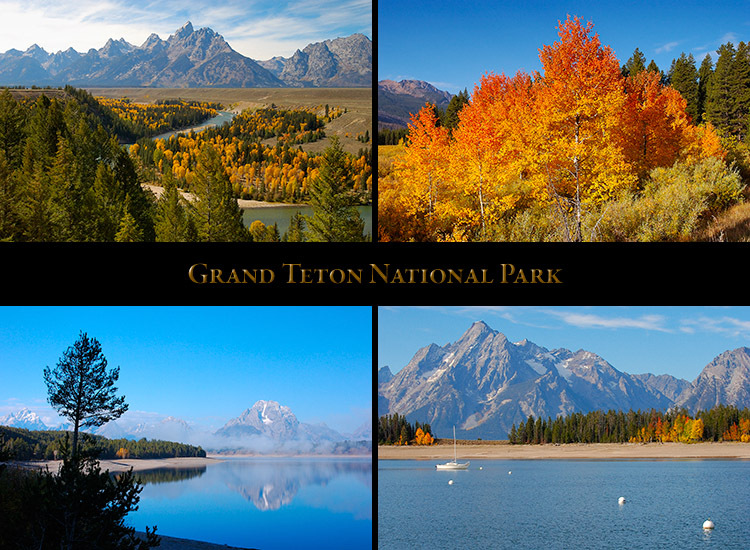 Click the Display Composite above to visit the Grand Teton National Park Scenic page. Click the Display Composite above to visit the Yellowstone section in the Wildlife Gallery.